Our laminate desktops are 1" thick, durable, GREENGUARD Certified, and come in black, white, cherry, maple, ash gray, walnut, and whiteboard finishes. Meet the desk that will rise to your expectations. 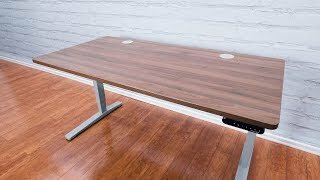 Using the height adjustable frame that Wirecutter named their top choice, the UPLIFT V2 Laminate Standing Desk raises the bar on efficiency, stability, and innovation in ergonomic workspaces. Our durable, affordable GREENGUARD-certified laminate desktops are eco-friendly and come in a wide variety of styles to match your office decor. If laminate isn’t your cup of tea, or you’d like to be able to compare all desktop materials, check out our UPLIFT V2 Standing Desk which consolidates all available 2-leg desk materials. Whether you choose the UPLIFT V2 Frame or the UPLIFT V2 Commercial Frame, you're getting the most advanced sit-stand desk available. Learn more about both the UPLIFT V2 Frame and the UPLIFT V2 Commercial Frame—and to compare the differences between them. Choose from one of our six different GREENGUARD-certified laminate desktops for a safe and sustainable workspace. GREENGUARD certification means that these desktops have been tested for chemical emissions and meet the standards set by seven different regulating bodies. Translation: you get a desk that's safe to use in your home or office. These 1" thick desktops are made from an eco-friendly office material that provides a sturdy, long-lasting workspace that fits your budget. Outfit your desk in black or white—or go with walnut, maple, cherry, or ash gray. Enjoy the look of natural woodgrains without paying for solid wood. Looking for something a little more customized? Reach out to us for our special order Wilsonart laminate options. We also have black and white ergo-edge curve desktops or 3-leg laminate desks available. To read more, check out our comprehensive Desktop Brochure for all of the options available to you. Why Is the UPLIFT V2 Desk Better? We created a sit-stand desk that goes far beyond the basics. The UPLIFT V2 Laminate Standing Desk is a reimagined approach to the height adjustable workplace, with improvements to stability at all heights, safety during movement, and reliability throughout its lifetime. Should You Get the UPLIFT V2 Frame or the UPLIFT V2 Commercial Frame? Click here to learn more about the differences between the UPLIFT V2 and UPLIFT V2 Commercial frames. The UPLIFT V2 Frame comes with a height range of 25.5" - 51.1" with a 1" desktop installed. This popular frame is remarkably sturdy, quiet, and designed with some amazing features. This frame (as part of our bamboo desk) was selected as the "Best Standing Desk" by Wirecutter! The UPLIFT V2 Commercial Frame comes with a height range of 22.6" - 48.7" with a 1" desktop installed. It has a lower starting height, a lower max height, and a wider overall height range than the UPLIFT V2 Frame. It meets and exceeds ANSI/BIFMA durability standards, while also meeting the ANSI/BIFMA G1-2013 height standard, a standard required by many of the world's largest companies. Although you might admire it for its sleek design, take a look underneath and you'll see four dozen independent, patent-pending mounting points. This exclusive feature lets you use your desk in a whole new set of ways with our growing collection of desk accessories. This includes functional additions like desk extensions, CPU holders, and power strips—and fun accessories like an under-desk hammock. Of course, all mounting points are hidden, allowing you to maintain a clean look at your workstation. When you upgrade to the Advanced Keypad, not only do you save time by not having to hold down buttons—you get access to advanced features. Sit, stand, or perch with quick one-touch adjustments on four programmable buttons. Switch between sitting and standing in a jiff, just by selecting your preferred preset. When you feel like standing, it gives you the perfect amount of time to get up and move your chair out of the way. Anti-collision sensitivity and a keypad child lock are two improved safety features. If your desk comes into contact with people or objects, it stops quickly for safety. You can also lock your desk height, a feature that comes in handy when there are little ones nearby. Set your desk's maximum and minimum heights to prevent your desktop from knocking into shelves above or file cabinets below. To reduce distractions, an auto-dark LED display dims the keypad 10 seconds after you press a button. We were named the "Best Standing Desk" by both Wirecutter and Forbes; and we're rated #1 by Wired and Lifehacker. We're honored for the mentions. From everyone here at UPLIFT Desk, we want to say thank you. It's been our mission since the beginning to help everyone build a workstation that allows them to work better and live healthier. Join hundreds of thousands of happy customers who are already enjoying the #1 rated sit-stand desk, including hundreds of Fortune 500 companies. As you piece together your perfect workstation, don't forget about power. Work knowing that your devices will stay plugged in and are safe from cord pulling and snagging when you raise and lower your desk. We have a solution for every setup and power requirement, from in-desk to clamp-on power options. Cords that hang loose are not just an eyesore; they can actually cause accidents at sit-stand desks. That's because your desk has the freedom to move, and if your cables don't have enough slack when you adjust heights, they can pull; if they have too much slack, they can get caught on other under-desk accessories. Stop this before it becomes an issue with a little wire management. Let us help you select tools to organize, store, and protect your cords. Your new desk even comes with a wire management tray to get you started. We understand that furnishing an office can be quite the task. Save time and make it easy on yourself; let our design team lay the foundations for your new office floor plan. We can create a customized layout to meet your needs, however big or small. If you're considering purchasing four or more desks, all you have to do is complete four simple steps, and we'll configure your office desk space for free, no strings attached. With your custom layout, you'll also receive a discounted quote on your order. You can't go wrong with our laminate desktop. Designed with durability in mind, this is a desktop that's ready to be there with you throughout the highs and lows at work. Laminate. Isn't that a little dated? Although laminate furniture has had some style fails in the past, we have worked with our designers to create an eye-catching desktop that mimics the look of real wood, minus the price tag. We exclusively offer Wilsonart certified laminates, which come with some of the most diverse finish options around, letting you create the custom desk that suits your style perfectly. Laminate is composed of thermally-fused melamine laminate over 45 lb density E-1 rated particle board core, and comes with a 3 mm PCV edge banding. All of the layers of the laminate desktop are fused under high pressure treatment to form a very durable surface that's ideal for work. Our laminate desktops are also at one full inch, which are much thicker than the laminate desktop thicknesses offered by our competitors. You bet! The height adjustment of an UPLIFT desk is great for sewing or crafting. Just lower your desk when you want to sit and sew, and then raise your desk to an ergonomic height when you want to cut out fabric. Yes! If you have your own desktop, check out just the UPLIFT Desk frame without a desktop.